Earlier this year, long before I was even THINKING about holiday projects, I found this set of nesting Christmas tree baskets. 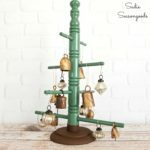 As I mulled over different makeover ideas, I realized they could be used as Christmas table decor in December, but continue on into the New Year as winter wonderland decorations. Hmm…I could do something with these! Not sure what I mean? Well, they were this great burnished gold color and could stand on their own. What if I painted one a dark green, painted one a bright white, and left one as-is? I could temporarily decorate them as Christmas trees but also use them as elusive winter decor in January and February. This post contains affiliate links for your crafting convenience. First for Christmas, then for winter! So, I set up my spray painting station outside so that I could spray paint my Christmas tree baskets, starting with the smallest one. I elected to transform him into a snowy white tree. Next, I spray painted the largest tree a dark forest-y green. To be honest, I wasn’t thrilled with the green spray paint- so I touched up the largest basket with some evergreen craft paint. NOW I was happy- and my Christmas tree baskets were done! I know I’m getting ahead of myself here, but this is how they’ll look AFTER the holidays, as rustic winter wonderland decorations. Won’t these be perfect just as-is for winter? But let’s back up a sec and focus on Christmas table decor, since that comes first on the calendar. There are lots of ways to decorate my Christmas tree baskets for the holidays- tiny LED lights, metallic braided cord for garland. But all I wanted to do was hang my tiny vintage Shiny Brites on the ‘front’ of my tree. However, I faced a conundrum- my daintiest Shiny Brites are ¼” to ½” in diameter but all I had were standard sized ornament hooks. That just would NOT work well- the ornaments would hang too long and the hooks would be way too visible. 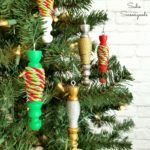 So, I nabbed my jewelry-making tools (namely a small wire cutter and round-nosed pliers) and created two mini ornament hooks from a single standard ornament hook! A-HA! These will be so much better! I simply snipped the hook in half with my wire cutters and curled the straight ends under with the pliers, creating tight curly-q’s for dainty ornament wires. And let me tell you- that worked PERFECTLY!! I made dozens of itty bitty ornament hooks that I’ll just keep in the same box as my tiny ornaments. Just like that, the larger of my painted Christmas tree baskets was decorated and ready to be used as Christmas table decor! Don’t they look festive? I could have decorated the middle gold Christmas tree basket but elected to just go with the two. And just like that, my Christmas tree baskets can be used for several months…first as Christmas table decor and later on as rustic winter wonderland decorations. Gotta love the easy decor transition, right? 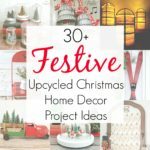 Want even more upcycled Christmas decor inspiration? Check out my full collection of projects here before you go! 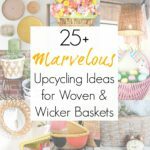 And file away this collection of repurposed winter decorations for later, as well. Very cute, you never disappoint! Thank you very much, Sheryl! OMG those are so cute as Christmas trees and nice as a more neutral winter decor too! Gotta love a two-fer project like that, right?? adorable!! you are the best!! Wow! I never tire of your amazing-ness !!! Thank you for sharing all your great ideas ! Keep them coming!! Thank you so very much, Stephanie! Another thing to add to my “look for” list! I was also debating lining them with a holiday napkin and serving cookies/nachos/chips in thelm or hanging them on the wall with a simple common pin! These as so versatile and I love how they will take a minimum of storage space once nested! Oh, nested–one would be pretty with a bird’s nest and a winter cardinal, too!